Bob Jones is everywhere in the far northern parts of Southlake where it adjoins Grapevine Lake. Bob Jones Road, Bob Jones Park and Bob Jones Nature Center & Preserve are just a few of the references to John Dolford “Bob” Jones, born a slave in 1850, the son of a white man, Leazer Alvis Jones, and his slave Elizabeth. Elizabeth, Bob and another son were granted freedom after the Civil War. This remarkable family bought 60 acres of bottomland and began farming and raising livestock. With his wife, Almeady Chisum, Bob Jones produced ten children and continued to work until the family owned almost 2,000 acres. 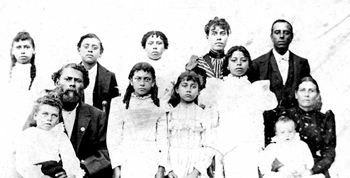 Bob and Almeady Jones in the late 1890s with their 10 children. Courtesy of SouthlakeHistory.org. Most of that acreage now lies beneath Grapevine Lake, acquired by eminent domain in the late 1940s. Bob Jones passed away in 1936, but it was a great loss to his descendants, many of whom still live in North Texas. After the lake came to be, the Jones family fields and pastures, their church and Walnut Grove School, disappeared to become the equestrian ranches and palatial estates of Southlake, one of the wealthiest cities in the U.S.
At the Bob Jones Nature Center, memories of the remarkable freedman remain. 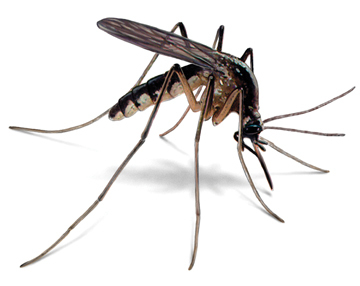 The family windmill may have finally bit the dust, and white-tail deer, not cattle, inhabit the wooded slopes that rise above Grapevine Lake, there are still whispers of him in the preserve. On this fine fall day, the preserve’s Bluebird Trail beckons, a modest mowed 0.8-mile loop with naturalist signs detailing its wonders. The first thing you notice is the sandy ground, so different from the more common black gumbo clay. Called the Cross Timbers, two wide stripes of the light tan soil, fertile and easy to cultivate, run vertically through North Texas into Oklahoma. The center preserves about 100 acres of the Eastern Cross Timbers ecosystem. Much of BJNC is kept as post oak savannah, with isolated copses of post oaks, blackjack oaks, black hickory and Texas ash amid the grasslands. It looks much as it did when Bob Jones cleared the Cross Timbers for agriculture. But the native grasses are gone, replaced by imported Bermuda. Piercing through are plants that once nurtured Native Americans, like the Turk’s caps with their red hips, beautyberry for tea, and the leaves of poke salad if properly prepared. Interspersed are the yellow wildflowers of fall like partridge pea and goldenrod. While the Bluebird Trail boasts fascinating signage of the Cross Timbers natural history, the Whitetail Deer Loop that extends from it tantalizes. Swinging wide through the edges of the preserve, it is quite silent except for the distant neighs of horses. Even though houses are visible through the wrought iron perimeter fence, a small group of wild turkeys loafs beneath some trees near a small pond. They peck through the foliage for grasshoppers, unconcerned with viewers. Park yourself at the picnic table behind the pond and just wait for them. Suddenly comes into view a few old post-oak fence posts of the old Bob Jones farm. 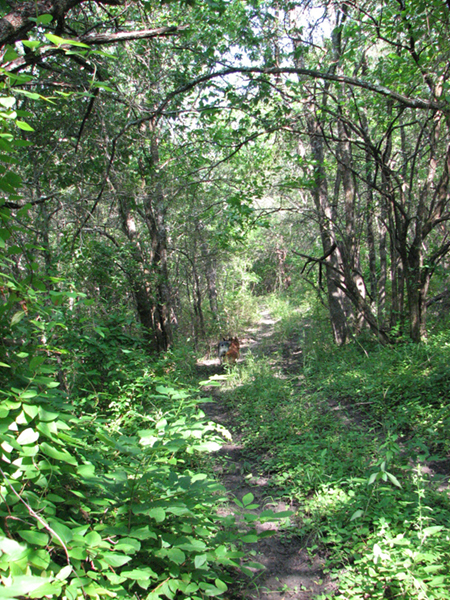 A narrow footpath through the grass leads away from Whitetail Deer Loop. Deer prints are easy to see in the sandy soil. The footpath goes along the property line deep into a scrub forest. The understory rustles with animal movement and the calls of blue jays, cardinals and crows are abundant. But the trail eventually runs out as civilization asserts itself again. Back on the Whitetail Deer Loop, the trail passes a prairie restoration project that seems to be losing its war with Bermuda. It plunges again into a moderately thick forest with plenty of bramble vine that deer enjoy. Ahead is another well-timed bench for tired hikers and a trail map. A narrow baffle to prevent horses from entering BJNC leads to a section of the Walnut Grove National Recreation Trail, named for Bob Jones’ school. 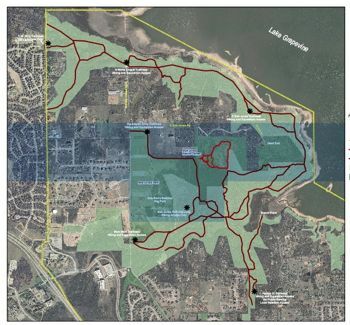 Around 20 miles of trails thread several hundred steeply folded acres of U.S. Army Corps of Engineer land that flanks Denton Creek, a feeder of the lake. This trail leads a mile or so down to the shore, but flood debris from the spring storms and damage by equestrian use when the trail was wet makes it too rugged on this day to hike, even if epic lake views are the reward. Now around lunchtime, the trail gets busy. A woman introduces her teenage son to basic naturalism and a father and his young son scope out possible trails for a future school field trip. All are thrilled to hear of wild turkey and deer print sightings. Soon the Bluebird Trail rejoins and quickly the red barn and buildings of the nature center come into view, the BJNC trail exploration now at an end. A short drive down Bob Jones Road reveals another trailhead for Walnut Grove National Recreation Trail at the curve. Returning to White Chapel Road, it dead ends at a sizable trailhead quite close to the lake. So tantalizing, yet preparations for a longer hike are lacking and a lakeside hike without my water-loving dogs would be too guilt inducing. 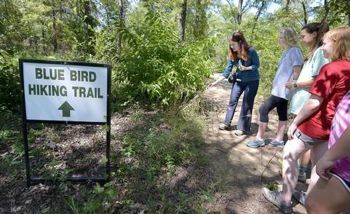 See full size map of trails in and around Bob Jones Nature Center. Winding past thoroughbred estates, mansions and manicured parks, Highway 114 looms. The swaths of white concrete reflect the mid-day light in a glaring reality. It’s this high-speed access that makes possible this wealthy suburban paradise. 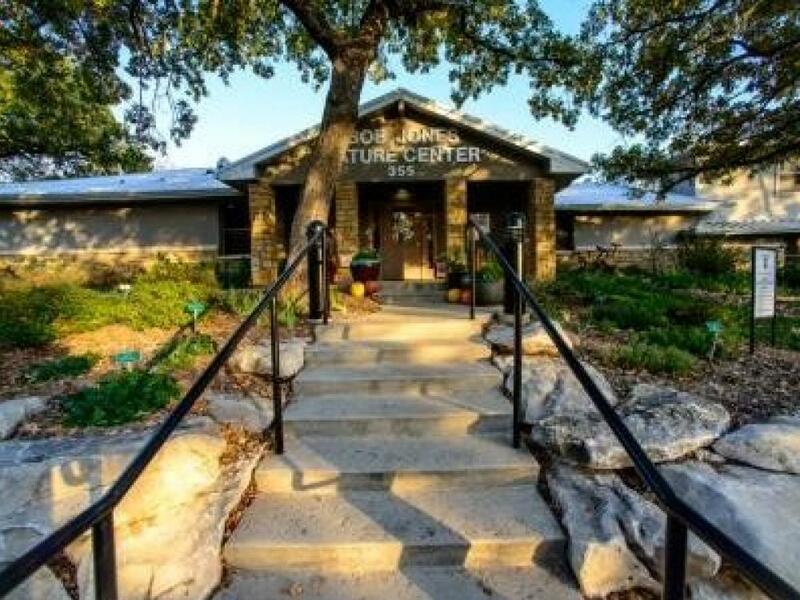 Yet tucked within all that are pockets of nature like the Bob Jones Nature Center & Preserve, holding the natural world in safety for future generations who might seek to restore balance. These arks of diversity dot the North Texas developed landscape. 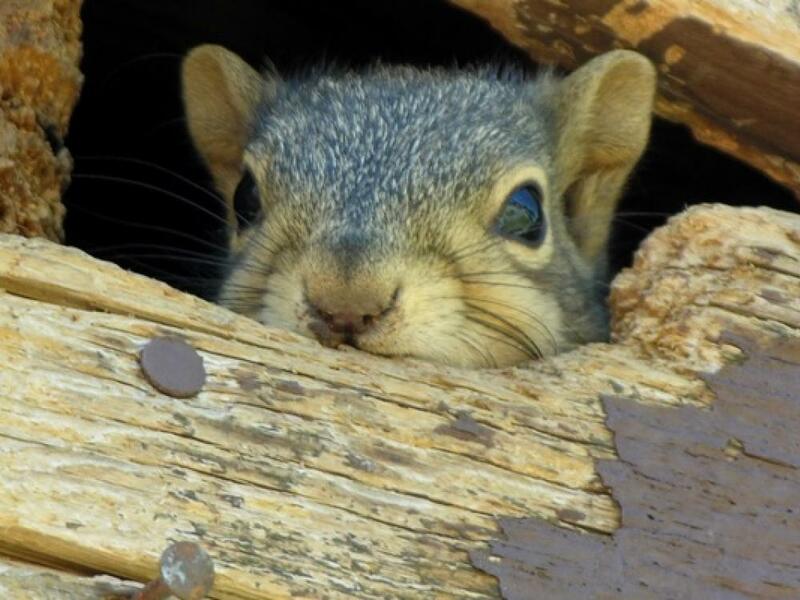 You might drive near one and never know unless you inquire and explore the world around you.